Then there was the matter of the hat. "That classic scene where James Bond comes into the office and throws his hat on to the hat stand was not as easy as it looked. When we were actually shooting, no one could do it. Everyone had a try, even Cubby. They sometimes had to throw is 80 times." 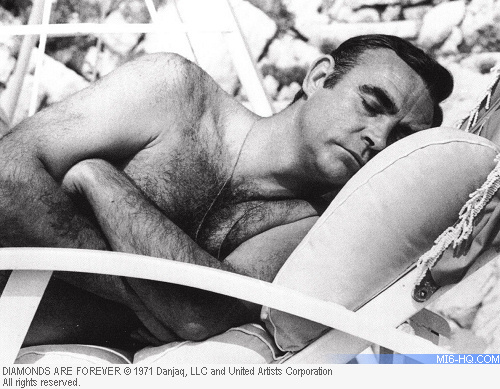 The Spies Who Loved Me (maybe): "What did I think of the three Bonds? I got on very well with Sean. He was extremely attractive. He was married to Diane Cilento, of course, and I was married to Peter (the late film director, Peter Marriott), but it's still possible to be attracted to somebody without doing anything about it. We really like each other." "But Roger will always be my favourite. He is the most beloved star of any I have ever worked with. He's sophisticated, compassionate, terribly good-looking, with a great body and a wicked sense of humour. There is a hint of danger in Sean that isn't in Roger, but Roger was the best." "George Lazenby? He wasn't terribly professional and was very pedestrian. He threw away the chance of a five-picture deal - he kept saying he could get a better deal until, in the end, he got none. 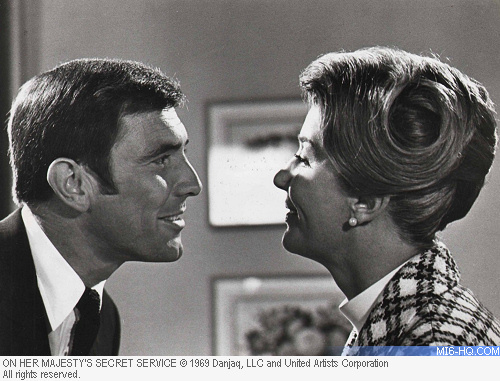 But ironically, I think 'On Her Majesty's Secret Service' was the best of the Bond films." "If I had my chance, I would like to be married to Roger Moore and have Sean as a lover." Sean and the Disappearing Hairline: "Sean totally lacked vanity. Everyone knew he wore a toupee, and at the end of every scene, he would throw it off. Other actors, like Christopher Lee in 'The Man With The Golden Gun', would never admit they wore a wig. But I remember once Sean got upset and said: 'Look at me. The more hair I lose on top, the more I grow on my eyebrows.' He had to shave his eyebrows." Those drinks: "The champagne was always ginger ale. The whisky was watered-down coffee. And the Martinis were pure water, neither shaken nor stirred." 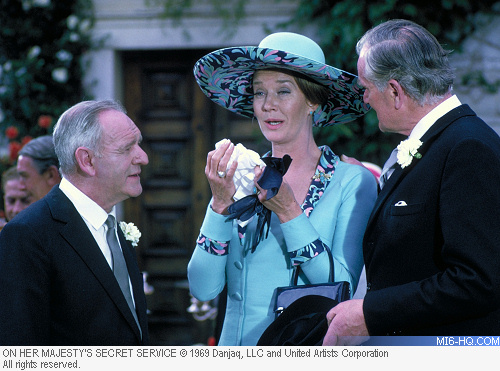 Drunks: "Bernard Lee, who played M and is sadly dead now, was pretty much an alcoholic. He was drunk much of the time, but you'd never know it. There was a terrible incident during 'On Her Majesty's Secret Service' in Portugal. Bernard had been drinking since about 9am. George Lazenby was on a horse and Bernard stuck a glass of wine under its nose. The poor thing reared up and kicked Bernard through some barbed wire. There was blood everywhere. The nearest thing there was to a doctor was the vet, who cut the loose flesh away with scissors and stitched Bernard's gashed leg. Yet he was still there on camera, the same day. Amazing." The Grasshopper: "Cubby very kindly gave my daughter Melinda, then 22, a part as an extra in 'Moonraker'. They were filming in Paris, and he looked after her as part of his own family. He used to take her home, cook her spaghetti. There weren't many other extras staying with the producer and his wife!"